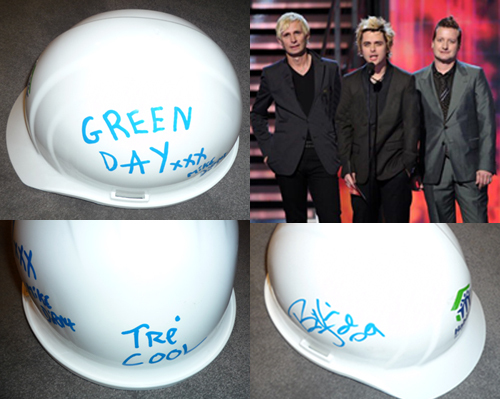 A hard hat signed by Green Day is up for auction on the Clothes Off Our Back charity auction site. The money raised will go to benefit Habitat for Humanity. Many of you will remember that Billie Joe, along with his family and Jason White, went down to New Orleans in 2007 with Habitat for Humanity to help rebuild a house destroyed by Hurricane Katrina. The auction ends in 8 days, and is currently at $200 (totally worth more for the fact that it benefits a great organization).